Italian number one Potito Starace and countryman Daniele Bracciali have both been suspended for betting on matches. 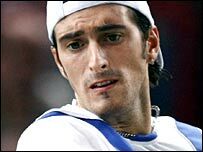 Starace, ranked 31 in the world, was banned for six weeks from 1 January and fined £21,400 by the sport's governing body for making five bets in 2005. Bracciali, ranked 258, was banned for three months and fined £14,300 for making around 50 five-euro bets. Italian Alessio Di Mauro was banned for nine months in November, the first player caught in a betting crackdown. He has said he would appeal against his ban to the Court of Arbitration for Sport. However, the Italian Tennis Federation has complained that the ATP, the governing body of men's tennis, was making scapegoats of its three players. "The penalties are out of proportion with the size of infringements committed by the two players," said a spokesman. "Obviously, neither player betted on their own matches." And Bracciali, 29, claims he and Starace have been hung out to dry because they are not big names. "We were the sacrificial lambs. That is why they have got upset with us," he said. "We are not champions and we are not important at a high level. But I cannot believe that we Italians were the only ones that placed the odd little bet. "The regulations of the ATP lend themselves to numerous interpretations of the rule 'not necessary to bet on tennis'. "Plus, if I had wanted to be sly, I certainly wouldn't place bets in my own name."